As you may have seen earlier, every cable that we installed was tested before it went into the ground. This was to check that they worked according to the tight electrical specification. Well, now that they are all in place, they have to be tested again to ensure that they are still working. During the installation process, the cables are exposed and vulnerable. As the backfilling work occurs, it is possible that a tool, rock or other object causes the cables to be crimped, abraded or even cut completely. And, of course, now that the burying has been completed any discovered fault constitutes a major problem. 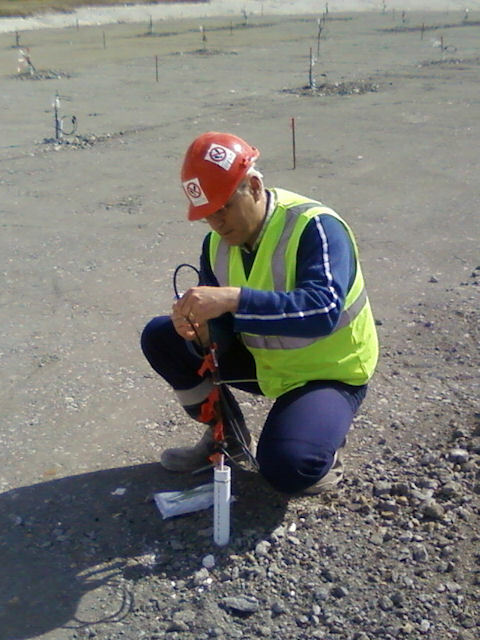 To test the cables, the same vector network analyser is used. However, instead of testing them individually, they are tested in pairs. A signal is sent from the RF-container patch panel out one cable. At the field end, a small loop back cable is placed to direct the signal out of the first cable back down the second cable. 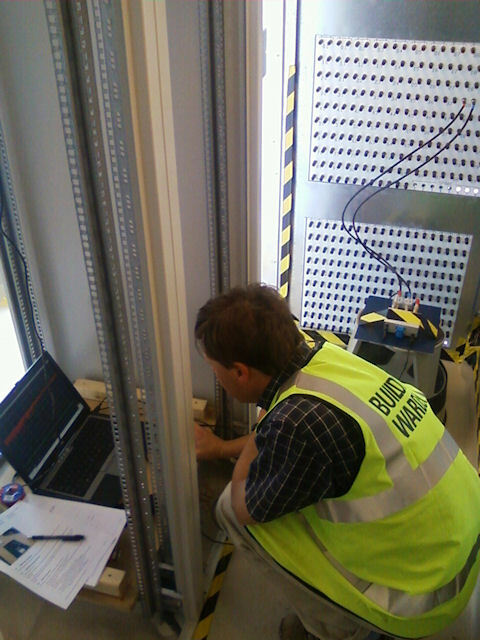 Then at the RF-container, the other end of the vector network analyser is connected to the second cable and the round trip signal degradation is tested. Harry Smith attaches the loopback to a pair of antenna cables on the HBA. As part of this process, the connectors and cables are visually checked and inspected and afterwards they are re-sealed and secured. Meanwhile, back in the RF container, Jon Eastment looks at the results of the cable-pair under test.